Right after working on the the yoga mat bag (see previous post), I proceeded to work on this bag. The experience of making it was the complete opposite of what I talked about in the post below. Everything just clicked in my head and I was going at it, stitch after stitch. It was a very fulfilling experience. I actually thought up the concept of this bag in my head on my bus ride to work last week. The idea came out of nowhere, sometimes the best ideas are the spontaneous ones. 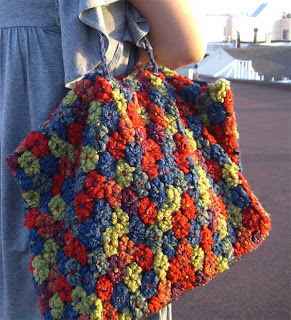 I decided to call it grandma's bag because the fabric makes me think of a shawl that a very cool grandma would wrap around her shoulders. This bag is now available in my shop. yes please, i hope to meet you at my show! the bag is lovely and the experience of making it sounds perfect. thank you mati and mushroommeadows!